Every noble wears a pin with their heraldic crest over their heart, but those aren’t the only demarcations of status in the kingdom of Braelin. While these are not the be-all-end-all of symbols, they are often seen and easy for uses of identification. Town Watch: A whistle worn on a cord around the neck. Crier: Cravat in the primary color of the house served (no crest). Courier: Gold and purple sash with the symbol of the monarchy. Nobles and commoners who serve a particular noble house. Diplomat: Sash across the chest, either in the colors of the household served, or a plain color with the coat of arms pinned/embroidered across. Herald: Square silk scarf or cravat in the color of the household served, or pinned/emroidered with the coat of arms. Retainer: Belt favor in the colors of the household served. Nobles dedicated to the orders of knights or mages. Squire: Thin, unadorned silver chain worn around the neck & badge of their knight master’s coat of arms worn on the upper right arm. Knight: Thick, unadorned gold chain & (often) a shield with the coat of arms of their liege lord. Retired Knight/Mage: Thick, unadorned black chain. Brigadier Knight/Mage: Purple/Green neck ribbon with a white moonstone pendant. General Knight/Mage: Silver chain of office (large links) set with white moonstone and winegrain/magepith. High General Knight/Mage: Gold chain of office set with white moonstone and winegrain/magepith. The Order of the White Lotus was founded many centuries ago, and has since represented the premiere order of knighthood in Braelin. The Order is led by a single knight known as the High General Knight. 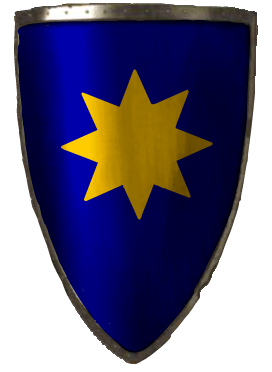 In 1209, the previous High General Knight, Rauf Westlake of Hawksworth, retired to his family’s estate after thirty years of dedicated service to the Crown. In his stead, King Darien Odell appointed then-Brigadier General Knight Iolanthe la Hale to the position of High General Knight. Locals of County Marcheford have been interested to note that the Lady Knight was once knight-master to their own Count, Sir Henry Marcheford. The following is what is commonly known of her life and lineage. Iolanthe la Hale is a direct descendent of the fabled Brandeles la Hale of the Circle of Five—a remarkably old lineage and estate, located in County Icemont, Blacknall. The younger of two children, la Hale was left to pursue the path of knighthood while her older sister trained to assume the family’s barony. She trained as a page in House Blacknall itself, and showed such promise and zeal that her knight-master wrote to the White Lotus on her behalf to recommend her for consideration. When the White Lotus accepted her into its ranks, she was given a post in Westvale. Her first true test as a Brigadier Knight came when a terrible peasants’ riot broke out in the city streets. The rioters seized a section of buildings in the artisans’ district and hunkered down, lobbing deadly spells, flaming bricks, and boiling oil down onto the heads of any who attempted to enter their makeshift stronghold. For three days the violence continued; finally, on the morning of the fourth day, the peasants signaled their willingness to negotiate at last. The Brigadier General Knight, Sir Dominic, relieved by the turn of events, accompanied his herald to the appointed negotiation spot as a sign of good faith. When they arrived, however, it was all in vain—the peasants had set a trap, and both the knight and the herald were murdered. Upon learning the terrible news, la Hale’s fellow Brigadier Knights were thrown into a frenzy; though strong and honorable knights, neither had developed particularly sophisticated leadership skills. Without their General to lead them, they did not know what to do. La Hale suggested that they wait until the General returned from the Black God’s Realm. But after more than half an hour had passed, it was clear that something was wrong. Perhaps their spirits had been trapped by a shaman, or they had been raised as undead creatures. She informed her team-mates that she was taking command, and rode her horse down to the front of the rioters’ stronghold. There she issued the following ultimatum: Either agree to surrender unconditionally, or be utterly crushed. The peasants replied with jeering and a hail of stones, debris, and a spell or two. “You have had your chance, and forsaken it,” was all the knight said before she turned around and rode for reinforcements. An hour later she returned with a contingency of foot soldiers and knights at her back. The force slammed into the building and, after a desperate and vicious struggle, the rioters’ cause was smashed. La Hale herself shackled and escorted the ringleader to jail after it was learned that he had imprisoned and then greater maledicted the spirits of both Sir Dominic and his herald. He was sentenced to death shortly thereafter. La Hale, for her part, was hailed as a hero for breaking the riot and restoring peace to Westvale, although there are certain elements of society who have given her the decidedly unflattering nickname “peasant-killer,” a moniker that has followed her ever since. When la Hale was just on the cusp of a promotion to Brigadier General Knight, the incident that brought her and esquire Henry Marcheford together occurred. No one knows exactly what happened that day, but everyone agrees upon the following: the young esquire was imprisoned after viciously assaulting his Gavellese knight-master, Sir Richard Astford; it was believed that he would stand trial and be sent home in disgrace, never to finish his training as knight; but then, unexpectedly, la Hale interceded amid a storm of controversy to take him on as her squire. After a long string of extremely minor assignments in the countryside, the pair were suddenly given a mission of great importance. There was a magical item that had malfunctioned badly in a little town near the Summer Palace. A contingency of Royal Mages, sent to investigate, had all been killed and the item appeared to have taken control of their bodies, which were wreaking havoc among the locals. Added to the problem was the fact that the monarch was preparing to retire to the Summer Palace in a little less than a week. Someone needed to go and secure the area while another group of mages tried to dismantle the item in question, and la Hale and Marcheford were finally selected for the honor. Once again, the details of the mission are widely unknown; but la Hale and her squire performed remarkably well, emerging from the mission triumphant. The dead mages had been released, the item had been safely neutralized, and no one was any the worse for wear. When la Hale returned, she was promoted to Brigadier General Knight and Marcheford’s training as a squire was complete. The two parted ways, though their friendship remains strong to this day. In 1209, la Hale was chosen by King Darien to become the High General Knight, the position which she occupies today.